All those people who loved and admired the great Italian tenor Luciano Pavarotti joined a chorus of grief as the world paid homage to the thrilling voice and ebullient personality. Amid an outpouring of tributes, the Vienna State Opera raised a black flag in mourning and his northern Italian hometown of Modena said it would name the city's theater after its native son. Newscasts and Web sites across the globe, from Israel to the United States to Europe, led with news of his death and radio stations aired his unmistakable recordings in memory. 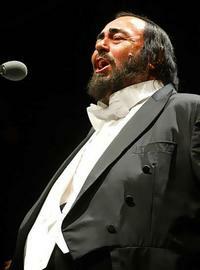 "I always admired the God-given glory of his voice - that unmistakable special timbre from the bottom up to the very top of the tenor range," Domingo said in a statement from Los Angeles. "They threw away the mold when they made Luciano. He will always be remembered as a truly unique performer in the annals of classical music." Carreras said he would remember Pavarotti as one of the "most important tenors of all times." "We have to remember him as the great artist that he was, the man with such a wonderful charismatic personality, very good friend and a great poker player," Carreras said in a video clip recorded by Swedish newspaper Expressen. Pavarotti died early Thursday at his home in Modena after battling pancreatic cancer since last year, his manager Terri Robson said in a statement. "The world has lost a great tenor, but I've lost a great friend, a brother," Mirella Freni, an opera great and one of Pavarotti's close childhood friends told The Associated Press. "We grew up together, studied singing and God blessed us with great careers. I've lost a brother." "It was incredible to stand next to it and sing along with it," soprano Joan Sutherland said of Pavarotti's voice at the time. A 14-week tour of Australia with Sutherland and her husband, conductor Richard Bonynge, gave Pavarotti the recognition he needed to launch his career. He also credited Sutherland with teaching him how to breathe correctly. "My husband ... and I had great joy working with him. The quality of the sound was so different. You knew immediately it was Luciano singing," Sutherland told BBC radio. Soprano Renee Fleming, preparing for a performance in Matsumoto, Japan, remembered singing with Pavarotti during a telecast at Lincoln Center. "He had the most perfect technique in the history of recorded music," she said in an e-mail to The AP. "He also captured the hearts of the larger public in a way which rivaled only Enrico Caruso in the 20th century." But Pavarotti's voice was just the beginning. He was credited with bringing opera to millions through his showmanship and his outdoor concerts. "He brought arts performance to people who don't go to opera houses. None of the classical singers have had the ability and courage to do that," said Hong Kong tenor Warren Mok. "He was one of those rare artists who affected the lives of people across the globe in all walks of life," the Royal Opera House in London said in a statement. "Through his countless broadcasts, recordings and concerts he introduced the extraordinary power of opera to people who perhaps would never have encountered opera and classical singing, in doing so he enriched their lives."